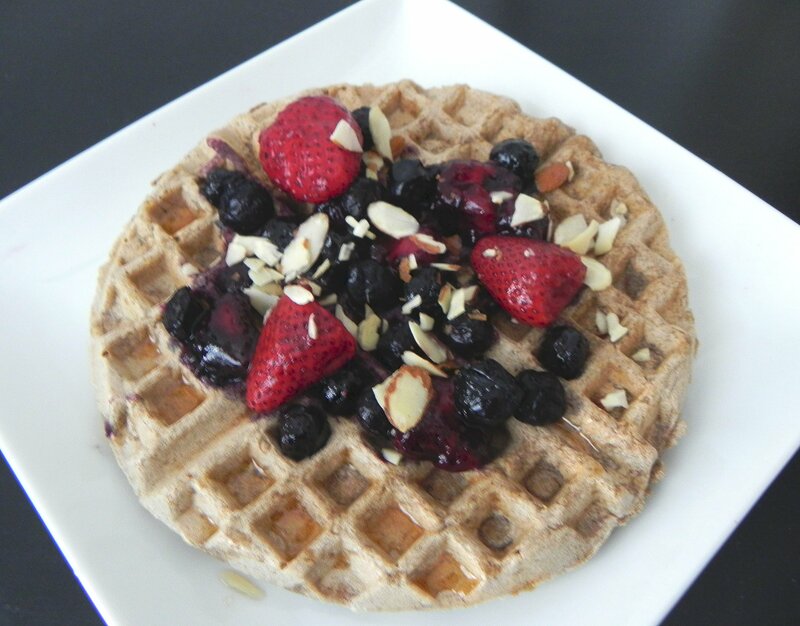 These waffles are high in carbohydrates, moderate in protein, and low in fat. To decrease the carbs some you can use a no-calorie sweetener in place of the brown sugar or simply use less of the syrup. Add an additional half serving of protein and a little fat to create a balanced meal and stabilize your blood sugar. Preheat classic waffle maker. (Note: if using a Belgian waffle maker, the waffles will be flat and not as fluffy). In a medium bowl combine flour, baking powder, vanilla, milk, vinegar and brown sugar. In a separate bowl, beat egg whites until frothy. Let batter sit for 2-3 minutes. Lightly grease waffle maker with cooking spray and add batter. Cook for 3-4 minutes. Meanwhile, combine berries and maple syrup in a small bowl. Microwave for 30-45 seconds until fruit softens. Transfer to a small saucepan over medium heat. Boil, stirring continuously, until liquid is reduced by half. Pour syrup over waffle, top with almonds if using, and serve warm.